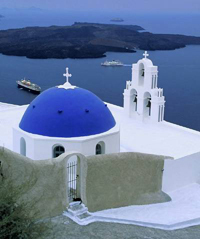 Why Use K & A For Your Removals To Greece ? We are a Greek owned company, with exceptional knowledge of Greece. Whether you are moving your entire home contents, or just sending a few boxes, you can rest assured that your shipment will be taken care of and delivered precisely to the place you wish and at the right time. Regardless of size and accessibility, we serve each of the Greek islands with the same weekly frequency and precision as any of the mainland destinations. K & A International specialise in house removals and freight between the UK and Greece, so you get the peace of mind from knowing that a team of dedicated professionals in the long distance transport industry are taking care of your goods. We’ve moved home contents and freight for hundreds of satisfied customers. There are always queries and anxious moments during a move and the last thing you need is an automated service or answer phone when you contact your removals company. With K & A, you’ll get a personal and individual service. Emails are answered by a real person and you can always telephone and speak to someone who will know exactly what is happening with your shipment. We’re big enough to offer a comprehensive range of services, but small enough to care. If the thought of packing up the contents of your home fills you with dread, let us take the strain for you. We offer a highly professional packing service at very competitive prices. Special export type crating and boxing materials are used to protect your goods in transit. We get a detailed understanding of each client’s removal requirements and tailor our removal service accordingly. At the Greek end in particular, we often arrange for loads to be transferred to special smaller vehicles, so we can access properties which are up the steepest of hills. We’ll even arrange for manual manoeuvring of a load at the end of the journey if it’s the only method of access. You want the best and most reasonably priced service available and we want to provide it, so to get the best idea of your requirements, we provide a free survey service for customers in England and Wales. These can usually be carried out 7 days a week, including evening hours. However carefully you plan your move to Greece, inevitably there are cases where you need to move out of your home in the UK before your property in Greece is ready. If this happens, we can provide secure storage facilities at very competitive prices for unlimited periods of time.